Age is just a number and no one is too old to celebrate life. There is no reason to mourn for the number of candles on your cake or the the digits of your age. So, erase your sadness, crush the anxiety of being old and put on your party hats to dance as long as you can. If your heart is young and wild, your life can never be old. 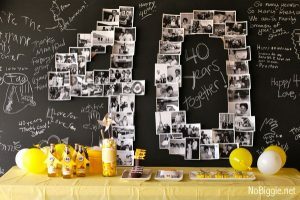 To cheer up your spirits, there are a few party ideas that can be planned for the ones turning 40 to rejoice their day and life because as they say life begins at 40. 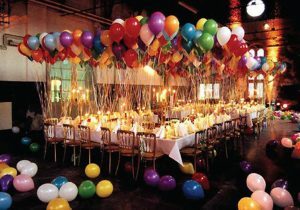 Plan a perfect outdoor birthday celebration for your loved ones and make them feel special. Planning and arranging an outdoor event requires a lot of time and effort, but the results are worth it because everyone feel special if people give their time and effort to do something meaningful on their day. One can plan a picnic with their family and close friends in a wide, spacious garden or in a beach amidst the sounds of sea waves. If you want to spend the time with only the birthday girl or boy than you can plan on going shopping or watching a movie. This simple things are within everyone’s budget and it is also very convenient yet thoughtful. If your budget is high then you can also organize a trip for them for two days or more. Taking out your loved one’s on their special day is perfect opportunity to make them happy because many people get juggled in their work or their busy lives to go out and just relax and enjoy the gift of life. ￼Throw the dreamy 40th birthday bash with amazing themes. Theme parties can never get old and they are the epitome of fun and enjoyment. There are loads of theme to select for the occasion. If you are looking for something subtle and classy, you can choose a color theme like black decor with rich red touches or royal blue combining with white or cream color. Complete this theme with soothing romantic music playing in the background along with the aroma of good wine and delicious food. There are also many fun and quirky theme parties, there can be a beach party, a barbecue, a casino party, a zombie party, a vampire party, a winter wonderland party, etc so the themes are endless and you can select anyone from them. While 40 gets younger every year, most people still consider 40 the age when they hit the top of the hill and start heading down the other side. This is “over the hill” party theme where everyone jokes about being old and aging and crying over the gone youthful days with a black mourning decor. 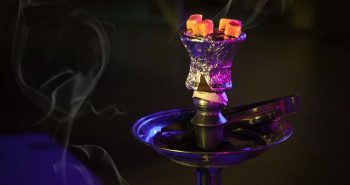 It is a fun way of enjoying. Theme parties are not only fun to attend but they are also fun to plan especially for the creative ones. There are a lot of small things in a theme party that must be considered like the design of plates and glasses( this can seem naive but it adds to the theme and gives a special touch), the lightnings, the time arrangement, the cake and many others. The theme parties are no doubt a lot of fun but two things can be considered before getting into it that is the budget and the invites, if this two are set than you are ready to rock as the perfect host for the perfect party! 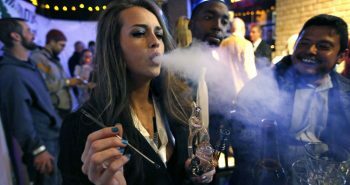 ￼At 40 years of age, people have crossed many paths of their life and experienced many highs and lows. What best way to look up on that path traveled than on their 40th birthday? The days passed are memories and moments that everyone of us want to remember our entire life. On the 40th birthday of your loved one’s, you can honor their life by reminiscing the days they have lived. This idea is very touching and affectionate. It shows how much you remember and care for them. But the ultimate question arises is that how you will do it? There are various ways in which you can help them relive their memories. You can make an album or a journal. You can stick the pictures of all the moments from their life and you can write about them. You can plan a party and make it as the theme. For that you can decorate the walls with pictures, you can flip the picture and write a year on it and on flipping it back again they can see the memory of that year in the form of the picture. This is very exciting as they recall the years and the great moments of their life put together by you.You can also plan an outing and you can go to all the places that had been important in their life, like you can take them to their school and their college. 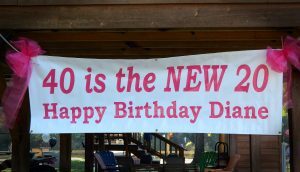 So there are many ways to celebrate the day that have embraced 40 years of life. Just be creative and plan the perfect nostalgic day. ￼Some people work too hard all time and on top of that they are party haters. So to plan anything special for them requires opening the lock of all those grey cells . But fear not, because there is always something for everyone. If your 40 turning favorite person, is always to busy or hates to socialize and do not know how to dance than this is the right solution for them. You can arrange a relaxing day for them. You can take them to the popular spa resort and let their anxieties and stress sunk in the pleasant atmosphere. You can spend the day at the pool, sun bathing and gifting a perfect book. You can cook food for them. So, there are many options to try to relax them rather than burdening them with the threat of a party. Cheer up your better half’s 40th birthday by planning a romantic date. Tell your partner that your love can never get old despite their age and bring back their smile through your actions. There are many ways to plan a romantic day. Hire a boat, decorate it with roses, set the music, select her favorite wine and cheer her up amidst the blue sea and clouds. You can decorate your house and cook dinner for your partner. 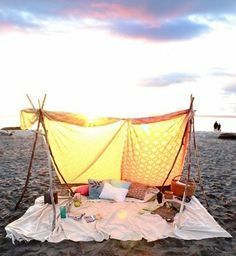 You can go camping together, read a book together among many other things. This is for all the energy maniacs out there. If your family and friends are energetic who wants some action and are bored of of the usual party routines then you should try some outdoor activities that will make everyone’s day. You can book a bowling alley and compete against each other, you can go out to amusement parks or water parks or you can try new activities like rock climbing, mini golf,tennis, etc. This idea is really affordable without much pompous and show off. It is a simple outdoor event with your near and dear ones. It is a small get together that promises a lot of fun and enjoyment and also not much planning is required for arranging this events, it can be planned on last moment without much hassle. If the birthday girl or boy likes mystery, riddles or detectives, than you can surprise them by planning a treasure hunt where they can be able to reach their present by solving the treasure hunt. You can also plan the same for the guests. There are many ways to excite the guests to enter your mystery party. All the guests can gather and complete a task at the house to receive their first clue ( a page of riddles to solve). Teams are set by you – like 3-4 people per team, but you keep it to couples if needed. After that it can be like a car rally, stopping here and there to pick up the items in the clues. There can be tasks like counting the fire hydrants on one street and reporting it at a coffee shop drive-thru and then taking the clue from them plus a snack. In the end, the hunts treasure can be lunch in a restaurant. If you are a crazy Bollywood fan and love to dance along the tunes of Bollywood songs, than arrange a Bollywood night party for your 40th birthday. To follow this idea, you can either choose a movie as your theme or all bollywood movies in general. Choosing the later will help in generating a lot of ideas instead of being restricted to one particular thing. There are many ways to make the birthday bash a bollywood blockbuster. Firstly, the decor. The decor is one of the most important things in a bollywood night. 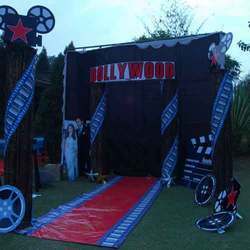 You do not have to create a movie set, but you have to make the place a typical bollywood hangout like you can stick movie posters on the wall, you can glam up the place with candles and glitters, you can make charts or you can make it all glamorous with bold colors, shiny drapes and a red carpet. Secondly, the dress code. The dress code is dressing like bollywood characters for example Munna bhai, krrish, Ra-one, or retro style actresses. Thirdly, there are games. A Bollywood night is not completed without a few bollywood games. A bollywood quiz, a acting challenge or a dancing competition, the list is endless. So, put on your favorite movie and plan the perfect masala night with music, gossip, glam, dancing and a lot of fun and enjoyment. This idea is for all the people who are young at heart and believes that they can never get old. According to the phrase, 40 is the new 20, you can do all the things that you did when you where in your twenties. For example, if your twenties was back in the 80s era, then you recreate that era and live your life as you were twenty. You can do simple things that you did in your twenties like dressing with too much makeup and getting drunk. You can also do something that you have always wanted to do when you were in your twenties. This is a very positive way of looking forward to ones life and this idea says it in all clear bold letters that age is no barrier if your heart is wild and crazy. Our life becomes short of the dreams that we want to fulfill. So reaching at 40 does not mean all the dreams have been fulfilled. There is something or the other we always want to do in our life but never get an opportunity. This is your chance to fulfill the dreams of your loved ones and win their hearts all over again. The extremity of this idea depends on the kind of dreams that you want to fulfill like it can be as simple as joining a Salsa class together or it can be as hard as buying a house. It all depends on the dream that you want to turn to reality.